Special Olympics Young Athletes™ is an inclusive early childhood sports and educational play program for children aged 2 to 7 years old, with and without intellectual disabilities, that includes games, songs and other fun, physical activities. With an emphasis on training and participation through activities and play, rather than competition, young athletes learn basic sports skills like kicking and throwing a ball, and playing with others. Young Athletes™ also provides children with gross motor skills training, group interaction and socialization opportunities. These basic skills will prepare the Young Athletes for future participation in sports. Why is Young Athletes™ important? Increases a young child’s strength and coordination in preparation for sports participation. Introduces young children to group play, cooperation and awareness of rules. Focus placed on socialization, interaction and fun. 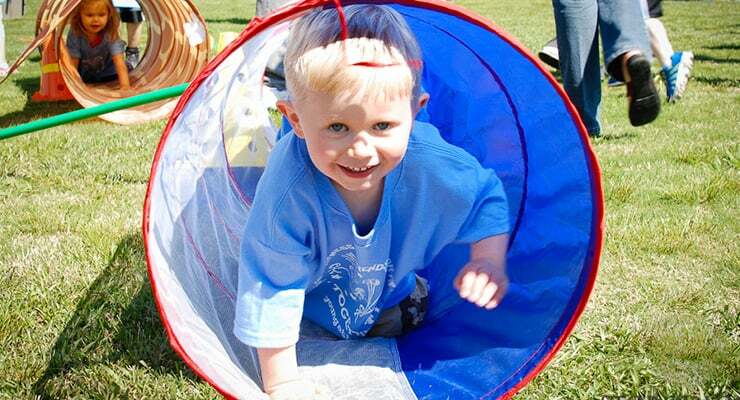 Parents: Young Athletes offers fun and fitness for the whole family! Parent/Child activity group where the whole family can exercise together! Special Education Teachers: Young Athletes is a great addition to your classroom! Available to Early Head Start, Head Start, Preschool and classrooms Kindergarten through 2nd grade. – Equipment kit with balls, cones, balance beam, etc. I want my child to participate in Young Athletes™! We are thrilled to have Young Athletes programming offered in over 45 Head Start centers and 38 elementary schools across the state. We definitely want to see more growth though! Email youngathletes@sonc.net to see what is offered in your community or to see how you can help start Young Athletes in your area (it can be a community-based program or done right in your home!). Complete the registration form below and submit it to your local contact. When in doubt, you can send it directly to youngathletes@sonc.net. Check out this great explanation of Young Athletes and Unified Champion Schools to better understand how to fully involve your school in these programs. Check out this webpage for more resources from SOI for your use. The Young Athletes™ Activity Guide provides the activities for an 8-week period leaving you with the flexibility for scheduling and implementation. If you want more scripted lesson plans and a timeline for administering the 8-week lessons, use the Young Athletes™ Curriculum. This contains the same information as the activity guide; it is simply laid out within a set timeframe. The training videos are a great resource to see how each activity should be offered. Each week has three days of lesson plans for a total of 24 days. Lessons are designed to be offered in sequence to help children become acquainted with the activities and build skills through repetition. You will see the summary cards provided for convenient use broken out below by activity. You can also print out the entire set here (Full set – Young Athletes Lesson Summary Cards).